NASA's F-15B testbed aircraft with Gulfstream Quiet Spike sonic boom mitigator attached. With itsextendable nose, a NASAresearch jet may resemble some sort of high-flying Pinocchio, but thissupersonic aircraft tells no lies. The F-15Bresearch jet's elongated nose - dubbed the Quiet Spike - is part of anexperiment by Gulfstream Aerospace Corp. and NASA's Dryden Flight ResearchCenter (DFRC) to determine ways to hush the sonic booms from aircraft flyingfaster than the speed of sound. "We'rereally focused on more of the civilian applications," said researcher MichaelToberman, NASA's DFRC project manager for the Quiet Spike experiment at EdwardsAir Force Base in California, in an interview. "It's really just fundamentalresearch into fully understanding sonic booms and how to mitigate them so thatwe can one day fly over the United States without having any concerns." CurrentFederal Aviation Administration (FAA) regulations prohibit commercialsupersonic flights over land and restrict military flights to special corridorsto limit the effects of humans and the environment below. Militaryaircraft the world over have been flying at supersonic speeds since U.S. test pilot broke the sound barrier aboard the rocket-powered X-1 aircraft in 1947. Itwas the RussianTu-144 and the joint British-FrenchConcorde supersonic planes that carried commercial passengers around theglobe at twice the speed of sound, or Mach 2. TheConcorde, which carriedpassengers through 2003, was limited to subsonic speeds while flying overland. "We believewe can reduce the sound made, for example, by the Concorde to the tune of10,000 times," Gulfstream spokesperson Robert Baugniet told SPACE.com. Sonic boomsresult from shockwaves that build up around supersonic aircraft as theyapproach Mach 1, or about 760 miles per hour (1,223 kilometers per hour)at sea level. "Instandard [supersonic] aircraft, there's usually two booms because theshockwaves coalesce into two large shocks," Toberman said. TheSavannah, Georgia-based Gulfstream developed and patented the Quiet Spiketechnology to determine how best to control or suppress the intensity ofaircraft sonic booms for potential supersonic commercial aircraft over land. Threeconical fairings along the length of the Quiet Spike are designed to producethree parallel shocks that head Earthward independently - rather than foldinginto a two large shocks - where their effects are muted, compared to theaverage sonic booms. "You'llstill have the booms," Toberman said. "They'll just be really small and theywon't make much of an impact." NASA hasconducted past research to suppress sonic booms, including test flights in 2003and 2004 to show that aircraftshaping can reduce the intensity of sonic booms. "I thinkthis is really building up a lot of interest in the industry into this sort oftechnology," Toberman said. "I'm hoping that it'll feed into a larger research[project] so that we can develop a full vehicle that will actually have a lowsignature...a low boom." The currentF-15B tests are aimed at determining the structural integrity of grafting atelescoping spike to the nose of a supersonic aircraft. "You'reputting this large structure protruding out from the front of the aircraft andit could have some destabilizing effects," Toberman said. "We want to make surethat the stability and control is acceptable for the pilot." 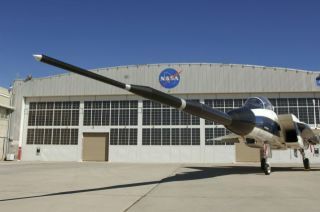 Built of acarbon composite structure over an aluminum frame, Gulfstream's Quiet Spikemeasures a total length of about 24 feet (seven meters) when fully extended.The spike consists of three primary segments - a four-foot (1.2-meter) tip thattucks into a six-foot (1.8-meter) section which slides into a 14-foot (4.2-meter)trunk protruding from NASA's F-15B aircraft. The entirespike can be fully extended with electric motors in 21 seconds, though thedeployment can be controlled during that process as well, Toberman said. To date,test pilots have flown six subsonic flights with the Quiet Spike-equippedF-15B, reaching speeds of Mach 0.8, or about 608 miles per hour (978 kilometersper hour). Over thenext two weeks, project managers plan to push the Quiet Spike up to speeds ofabout Mach 1.8, or about 1,370 miles per hour (2,205 kilometers per hour), butdon't expect any supersonic silence from their F-15B aircraft. "That'sreally because the actual aircraft itself is rather noisy," Toberman said,adding that the research F-15B has not undergone modifications to quiet itsinlets. Instead,NASA test pilots will fly a second F-15 aircraft alongside the test vehicle tomeasure the structural integrity of the Quiet Spike at supersonic speeds. Subsonictests have proven favorable according to test pilots, Toberman added. "Actually,the pilot's comments have all been very benign," he said of the subsonic QuietSpike tests. "He doesn't even know it's on there for the most part."